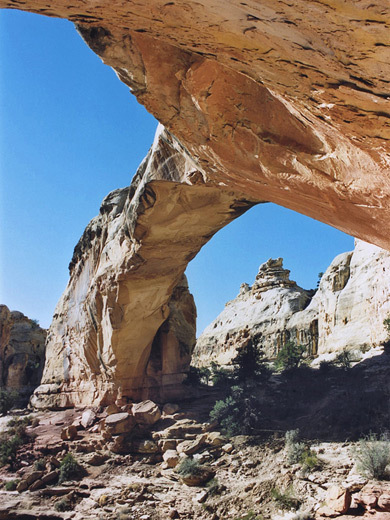 Hickman Bridge is one of the highlights of Capitol Reef - a large, elegant natural arch in a scenic side canyon far above the Fremont River, surrounded by the great white domes of Navajo sandstone that characterize the national park. It is quite easily reached, by just a 1.2 mile hike from UT 24, and receives a steady stream of visitors, some of whom continue up the linked Rim Overlook Trail, a steeper, 2 mile path that climbs further up the cliffs then heads westwards to a summit at 6,900 feet with panoramic views over the reef and the river valley. Hickman Bridge topographic map, trail map for Capitol Reef. 7 views of the Hickman Bridge Trail. The Hickman Bridge trailhead is at a parking area two miles east of the visitor center turn-off, just beside the point where UT 24 crosses from the south to the north side of the Fremont River, and opposite the north end of the Cohab Canyon Trail. An NPS brochure is available, describing 18 numbered points of interest. The route is along the river bank for a short while, up the steep hillside to the north and past the turn off for the Rim Overlook & Navajo Knobs trails, across an open area then down into a shallow, rocky canyon. The bridge is half a mile further at the head of the canyon, and has a very impressive setting, above most of its surroundings and quite far from the adjacent cliffs. 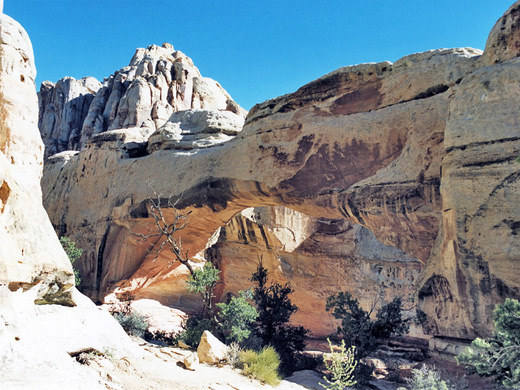 It is comparable in dimensions to the three arches of Natural Bridges National Monument, with a 130 foot span and 125 foot height. The far end of the path loops under the bridge and provides plenty of different vantage points allowing photography from a variety of angles. Just beyond is a good overlook of the Fremont River valley and distant lands to the west, while all around are eroded rock formations of many colors, with larger domed summits in the distance. The round trip to Hickman Bridge and back (2.5 miles) takes around one hour.